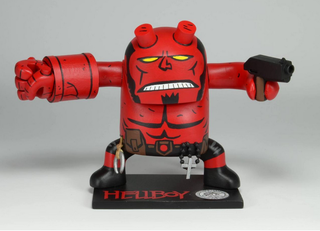 Custom Hellboy figure by NECA artist Geoff Trapp. for this weekned's upcoming Hellboy tribute show at Hero Complex in Los Angeles. See more sculptures, nesting dolls, and illustrations from the show below. You can see more of the artwork from the show at this Tumblr,and visit the show this weekend at Hero Complex in Los Angeles.